Android 8.1 Oreo based OFFICIAL LineageOS 15.1 for OnePlus One (bacon) is now available to download on the OFFICIAL LineageOS website. This is a step by step guide that explains how to install the Official OnePlus One Lineage OS 15.1 ROM. This OnePlus One LineageOS 15.1 OFFICIAL build is maintained by jrior001. Installing a custom ROM may require an unlocked bootloader on OnePlus One, which may VOID your warranty and may delete all your data. Before proceeding further you may consider backup all data on the phone. You are the only person making changes to your phone and I cannot be held responsible for the mistakes done by you. – Here is the TWRP update for OnePlus One. This recovery guide requires an unlock bootloader on OnePlus One. Download and Copy the GApps and OnePlus One OFFICIAL LineageOS 15.1 ROM ZIP files to your phone. Boot into the TWRP custom Recovery to install this Lineage OS 15.1 for OnePlus One. Install the OnePlus One OFFICIAL LineageOS 15.1 ROM file that you have copied into the phone. Reboot and Enjoy the Android 8.1 Oreo Lineage OS 15.1 on OnePlus One. 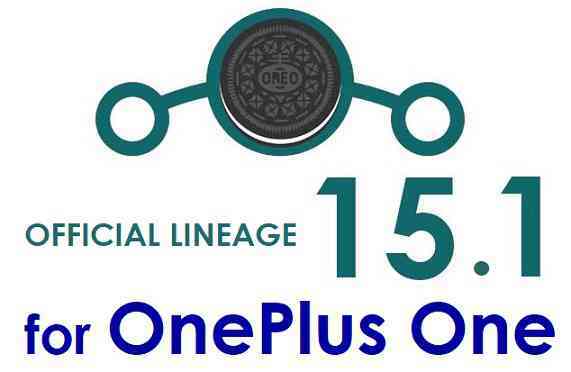 Copy the latest OFFICIAL Lineage OS 15.1 for OnePlus One ROM ZIP file, Oreo 8.1 GApps and/or supersu ROOT package to the phone or use the updater app to download the LineageOS 15.1. If you don’t have GApps after upgrading the OFFICIAL LineageOS 15.1 on OnePlus One, then flash the GApps. If you don’t have ROOT after upgrading the OFFICIAL LineageOS 15.1 on OnePlus One, then flash the SuperSU or Magisk or the Lineage SU binary. Once everything is done, reboot and Enjoy the OFFICIAL Lineage OS 15.1 for OnePlus One. If you have found any BUG on this OnePlus One OFFICIAL Lineage OS 15.1 ROM then you can raise a jira ticket on LineageOS website. Stay tuned or Subscribe to the OnePlus One (bacon) forum For other Android Oreo 8.1 ROMs, LineageOS 15.1 ROMs, other ROMs and all other device specific topics. TWRP said it can’t verify zip archive. When zip verification disabled it installed with no problem. Thanks for making an official LineageOS 15 for our OneplusOne! I installed it last week and so far only saw these issues. I wonder if I’m the only one with them. Slow GPS fix: don’t know why. In 14.1 it tooks often less than 3 seconds to fix, now it can take up to 3 minutes. Being on an official build, the advantage is you can raise a jira ticket on https://jira.lineageos.org/secure/Dashboard.jspa and convey your concern(s). TIP: Create different tickets for different issues.